The very basis of Scotch snobbery is the ‘age’ statement. Like a fine wine from Bordeaux, the producers of Scotch whisky maintained that a good Scotch — a blended whisky or a single malt — acquires more flavours and greater complexity as it spends longer time in the casks. In the process, as a result of natural evaporation, the industry loses two per cent of the precious liquid every year — the famous ‘angel’s share’ — and Scotch is able to command the cachet (and the prices) it does. The age on the bottle signifies the age of the youngest whisky in the blend — and yes, even single malts, unless specifically mentioned as ‘single cask’ single malts, are blends of whiskies maturing in different casks, but in one distillery. The world went along with this view until Hibiki — the Japanese single malt from Suntory — caused a tremor in the international market 17 years ago. The whisky flew off the shelves — perhaps because of the surrogate advertising time it garnered in Sophia Coppola’s multiple-Academy Award-winning Lost in Translation, where the principal character, played by Bill Murray, arrives in Tokyo to shoot for a Hibiki commercial. Suntory, explains Ankur Chawla, founder of Delhi-based beverage consultancy ScopeBev, was clearly not prepared for this explosion of interest. It was also quick to realise the first batch of the Hibiki 17 Year Old would run out much before the replacement stocks would mature for the market. And if the demand remained unmet, it would be bad news for the Japanese alcobev behemoth. The ensuing debate — and the fact that the industry had completely misjudged the emerging demand-supply gap — gave birth to the paradigm-changing idea of NAS (No Age Statement). Scotland’s law requires whiskies to be kept in wooden casks for a minimum of three years to qualify for the appellation ‘Scotch’. Industry insiders argued a Scotch, whether produced in Scotland or Japan, can legally be bottled and sold from its fourth year. Today, at least eight countries outside Scotland — India, Japan, Taiwan, France, Italy, Sweden, Australia and New Zealand — produce award-winning Scotch whiskies. There are techniques such as the use of caramel to mask the pallor of a youthful whisky or artificially hastening the maturity process, or adding synthetic flavours that mimic those a whisky extracts from its cask. The last technique is widely used in the Indian alcobev industry, which passes off distilled, flavoured and coloured molasses-based extra neutral alcohol as ‘whisky’ (Amrut, Paul John and Rampur being the recent exceptions). Macallan, described by connoisseurs as the Rolls Royce of whiskies, became the most prestigious label to adopt the NAS philosophy when it dropped the age statement from its Rare Cask whisky sold in travel retail outlets in 2014. The Rare Cask, according to Macallan, is a blend of rare whiskies chosen by chief distiller from pre-selected 256 casks a year not because of their age, but to achieve a specific character and colour. Likewise, another sought-after Macallan, the limited 1824 Series, does not have any liquid that dates back to the year mentioned in the label (it is the year when the Speyside distillery — the first in Scotland to be licenced — was founded by Alexander Reid). 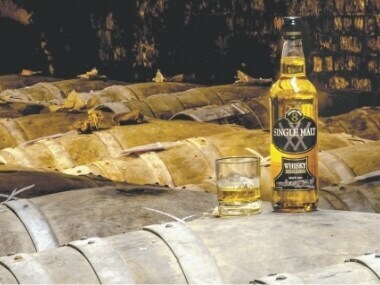 What it celebrates instead is a whisky that is at the peak of its perfection, irrespective of its age. Sandeep Arora, Contributing Editor Whisky Magazine UK, says it is not necessary the longer a whisky stays in wood, the better it would taste. “It is said that the longer you keep a whisky in a barrel, the happier it is (the angels certainly are), but eight years is the time it takes ideally for a whisky in Scottish conditions to extract all the flavours it can,” he says. To produce Scotch, two kinds of barrels are favoured — ex-Bourbon, which adds vanilla, honey and caramel notes with a hint of oak to a whisky, and ex-sherry, which makes a whisky darker, spicier and more flavourful. Beyond eight years, whiskies run into the risk of letting the wood in their barrels overpower the way they should taste. There’s, therefore, a clear commercial motivation for the push towards No Age Statement whiskies. The Scotch whisky market has been experiencing an amazing growth — exports from Scotland shot up by a record 7.8 per cent in 2018 to touch a figure of £4.7billion — and much of this has been powered by millennial consumers, who have gone back to drinking whisky. It is this generation that is more taste than age-oriented, says Arora. In the words of Chawla, the millennials are moving from “the label to the liquid”. Each generation affixes its distinctive stamp on a popular product, even if it is as rooted in tradition as Scotch whisky. The age of the ‘no age’ is well and truly here.